(Polyantha) Modern shrub roses should be so lucky to carry all the good qualities of this fine rose. 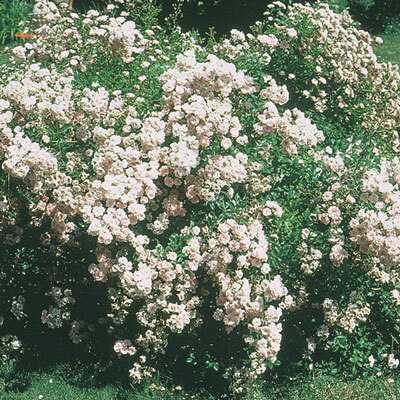 She bears small ruffled soft-pink flowers in large pyramidal clusters that bow gracefully to Mother Earth, giving the rounded bush a profusion of glossy green leaves and pretty blossoms from head to toe. She's hardy and naturally disease resistant. Proven consistent performer. Best color when cool. Hardy & clean.